There are so many great ladies' fashion boutiques in Edinburgh, with something for all tastes and styles. If you're looking for some lovely independant shops to visit during your stay with us, we've picked out some of our favourites. Once you've found this gorgeous destination store, just off Edinburgh's Grassmarket, there'll be no going back. Fleur MacIntosh opened Godiva Boutique in 2003, and has long since supported independent fashion designers. She showcases their hand-made one-offs and limited editions garments, alongside her range of hand-picked quality vintage. Godiva also offers a made-to-measure service. Find the design that you love and Fleur's amazing team will make the perfect fit for you, in your chosen fabric. So, you'll never blend into the background again! This vintage fashion boutique in Stockbridge is a real hidden gem. Climb down the stairs into this basement store adorned with flowers, and step back in time. Owner Claire Patterson selects the most beautiful and wearable vintage clothing, jewellery and accessories for the store. With everything from 1920s to 1990s fashion, you're sure to find your retro style here. The Those Were The Days team are always on hand if you need any styling advice or guidance. And, if you're searching for a particular item, they can even help source it for you. If you usually dread shopping for jeans, then ALC is the place for you. This independent fashion store is dedicated to solving your denim dilemmas. Adele Louise Crombie has been helping customers to find the perfect pair of jeans since 2012. Adele and the ALC team offer a relaxed, personalised service, which makes shopping for denim clothing and capsule wardrobe accessories a very pleasant experience. Jeans shopping will never be the same again! So, those are our three top tips, but there are so many more wonderful independent fashion boutiques in Edinburgh. 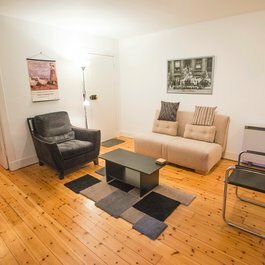 And, if you're still searching for holiday accommodation for your shopping trip, look no further than our stylish city apartments. Just get in touch if we can help you to plan your visit. Edinburgh's Grassmarket is an ancient market place in the Old Town. A wonderful place to sit and watch the world go by!